Feel no pressure by reading this letter to pick me as your next Browniebabe, although I will be honored if you do so. I think I can be a great Browniebabe because not only my brownies are simply marvelous, with all modesty of course, but they are also filled with love and no butter. Yes, not an ounce of butter. Except if you count the tiny bit of butter that I used to grease the pan! 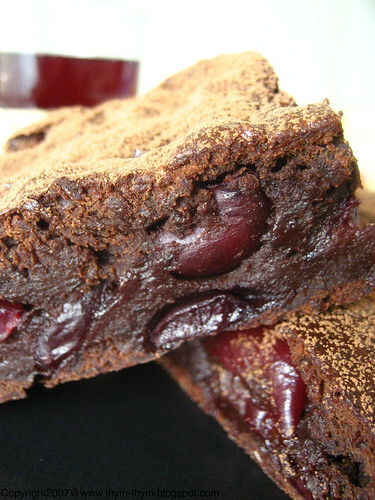 My chocolate and Cherry brownies will satisfy your cravings for brownies while allowing you to slip into your favorite swimming suite with all confidence. My brownies are hips and thighs friendly; just ask mine they will testify. No need to run, no need to worry because my brownies are only 137kcal per serving but 100% sweet and tasty. 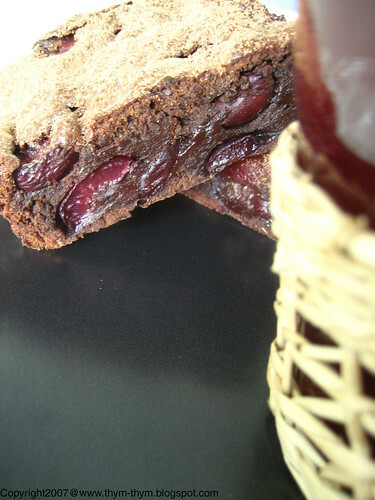 Filled with cherries and prunes, my brownies are perfect for summer as they are moist, smooth, fruity and fudgy. Want to dress it up a little bit for a special dessert? No problem, just serve it on a cloud of Crème Anglaise and your guests will praise your talent for years to come. So Myriam, My brownies are ready to be crowned and my waist can’t wait to be wrapped by your gorgeous apron. If you do pick me, which I think you should but again no pressure here, I will be the happiest girl and the butter-free Browniebabe of them all. Put the prunes in a saucepan with ¼ cup of water and cook for about 10min until the prunes softened and it’s left of the liquid only 2tbsp. Put the chocolate in a heatproof bowl and set over the prunes until the chocolate has melted. Transfer the prunes to a food processor and blend to have a smooth puree. In a mixing bowl, mix the prunes with the egg, the cocoa powder, flour, salt, chocolate, sugar and vanilla, until you have a smooth yet sticky batter. Using a wooden spoon, fold in gently the egg whites, followed by the cherries. Grease and flour a 9-inch square pan and fill with your brownie batter. Don’t worry if the batter feels sticky, it’s the prune puree that gives this texture. Smooth the top with a damp spoon and bake at 375F for about 35min or until it feels firm to the touch. Cut into squares and can be served with Crème Anglaise. Tips: Store the brownies in an airtight container at room temperature and covered with baking or wax paper. They will keep their freshness and moisture for up to four days. They are better eaten the next day. Mettre les pruneaux dans une casserole avec 100ml d’eau et faire cuire sur feu doux pendant 10 min jusqu’a ce que les pruneaux deviennent plus tendres et qu’il en reste de l’eau de l’eau que 2 c.s. Mettre le chocolat dans un bol et poser sur les pruneaux jusqu’a ce qu’il fonde. Transferer les pruneaux vers le robot menager et mixer jusqu’a obtention d’une puree homogene. Melanger la puree de pruneaux a l’oeuf entier, le sucre, le cacao, la farine, le sel, le chocolat fondu et la vanille. Vous obtiendrez un mélange epais et homogene. Incorporer delicatement les oeufs en neige a l’aide d’une cuillere en bois et enfin les cerises. Beurrer et fariner un moule carré de 20cm et verser dedans votre pate a brownie. Lisser la surface a l’aide d’une cuillere legerement mouillee et faire cuire dans un four prechauffe a 180C pendant 35min ou jusqu’a ce que la surface soit ferme au toucher. Couper en carrés et servir, comme je l’ai fait, avec une crème Anglaise. Astuces: Conserver dans une boite a fermeture hermetique et couverte d'un papier sulfurise. Se conserve jusqu'a quatre jours. Ces brownies sont meilleurs le lendemain. butter free brownie babe is my hero!!! You crack me up! and these are definitely going in my to-do list, gotta love something a bit gentler on the waist. You are my hero!! Butter free is the way to go! BTW: I can state with 100% confirmation that the Browniebabe apron looks hot and as the current Ms. Browniebabe, I am willing to pass on the crown to you anytime Rose! thanks for joining browniebabes. your brownie looks wonderful. Rose, my thighs and hips are crying out for something as good as these! What a great idea for brownies. MMMM I think you are getting my vote. They look lovie and you real cherries. Yummy! Plus no butter Amazing. Wow! I expected to find vegetable oil or something like that in the recipe to replace the missing butter, but no! And sure, the chocolate adds some fat, but nothing like what's in the butter bombs most brownies are. These sound great--and not too sinful. Thanks! Rose, this is just perfect! No fat and luscious, omg! Oh, you are a wiley one! I love the whole idea behind this post. These brownies look wonderful, I definitely have to try them sometime! Ca me fait penser au sticky toffee pudding. En tout cas, ta recette m'intéresse, je vais la tester sans aucun doute ! Although I'm skeptical about the lack of butter, those DO look pretty fantastic! You are a genius and a cunning one too. 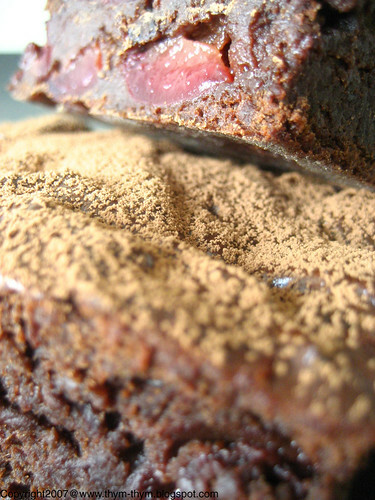 This brownie looks so moist and yummy. I just had a piece of brownie, made with less butter (experimenting with low-fat brownie recipes) but I never thought of adding prunes for added moisture. Thanks for this wonderful recipe. - Thank you very much Marce. It is not only gentle on the waist but also very moist. - Meeta, now you are tempting me even more to become this month brownie babe. Thanks for passing the crown. - Thank you Myriam. See you then at th roundup! - Mima, tu me tiendras au courant du resultat. Je peux t'assurer que tu vas l'adorer. - Lucy, all thighs and hips should have this guilt-free kind of brownies. It was all my pleasure. - Thanks for your vote Cheryl. - Thank you very much Jerry. - Terry-B, we don't want our brownies to be sinful, just a little provocative. Thank you for yur visit. - Patricia, I thought you would like them. I know that you are watching your diet lately. - Mehgan, yours look delicious too. See you then at the roundup. - Merci beaucoup Mingoumango. Je n'ai jamais essaye le sticky toffee pudding mais je te garantie que ces brownies sont un regal. Surtout le lendemanin. - Brilynn, I was skeptical too about the lack of butter in the recipe as I am not a believer in non-fat cooking especially when it comes to backing, but this recipe was for me a real surprise. It is really delicious and moist, especially, for some reason, the following day. - Dear Nora's hips and thighs, tell Nora to bake you those butter-free brownies as they are not only to die for but they will also avoid fats and calories to built around you. And we both know how much you love to collect all the calories, right? Say hi to Nora for me and take good care of her. If I could vote, I would vote for you!! I just saw your brownies - lovely! Your photos are fantastic and I just can't resist the chocolate+cherry combination, obviously. - Dayna, Thank you very much for your lovely message. Well, I guess I should have added more butter for the appron to slip right on my hips...but your words made me feel better. Have a nice evening.